I first painted my nails all over with the OPI varnish. It took 4 coats to get it to a usable colour for these. I dipped my finger into the gin and then dipped the newspaper cutouts into the gin while holding it with tweezers. 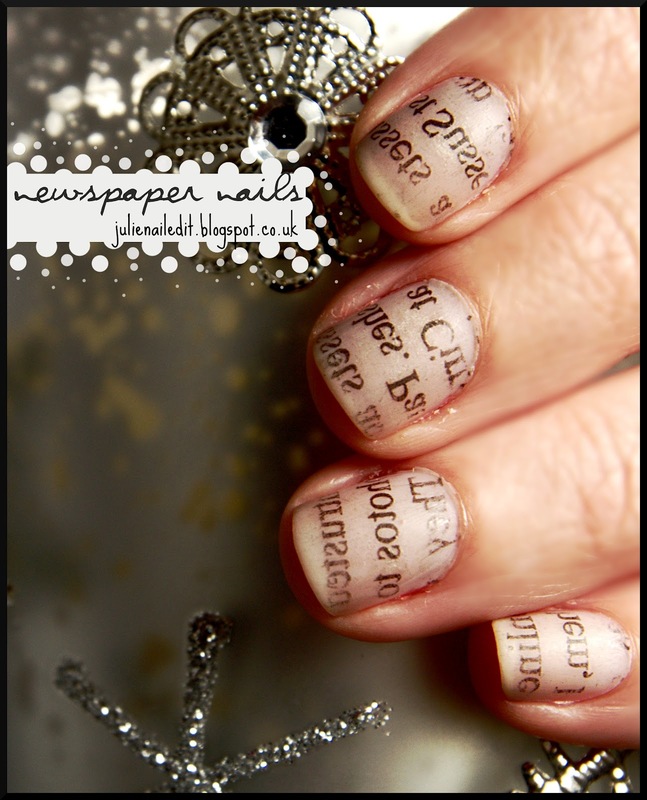 Then I carefully positioned the newspaper print side down over my nail the way I wanted it and covered it with the cotton wool and pushed down an even pressure all over my nail for about 20 seconds. I removed the cotton wool and gave the newspaper a quick last push down to make sure as much ink got off it as possible and gently peeled it off with the tweezers. Any excess paper left on my nail I picked off with the tweezers gently. But don't worry too much about little fluffys left because they are not noticeable after a topcoat. Repeat these steps with all your nails and you should have these!